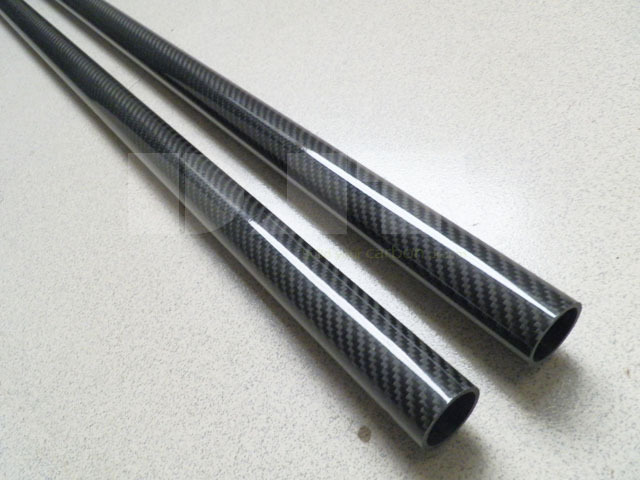 This carbon fibre tube is in twill weave pattern and glossy finish. We have thousands of mandrels in the factory to make various carbon fiber tubes, please advise us the inside diameter, the wall thickness and the length you want, we will quote for you within 24 hours. For our standard carbon fibre tubes, the first layer is TAIRYFIL 3K carbon fiber fabric and other layers are Uni-directional carbon fiber fabric, the carbon fiber parts by this material structure will satisfy many applications, such as multi-copters, bicycles, RC airplanes, sport equipment and so on. If you have special request, please feel free to let us know the use, the density, Youngs Modulus you need. For example, if you need the carbon fiber tubes as a sailboat boom, we can make custom tubes to satisfy your request, we have RTM technology and Filament Winding Technology for your choice. If you want an affordable solution, we can use carbon fiber mixed fiberglass structure, or all fiberglass structure, we provide composite tubes to satisfying your needs. This is woven surface carbon fibre tube in glossy finish, we also have other styles for your choice. We can put your decal on the tubes, please send us the AI format file of your logo. Please feel free to email to info@djtcarbon.com for more information about DJT carbon fiber products and solutions. Multi-copters, Bicycles, RC Airplanes,Sport equipment etc.